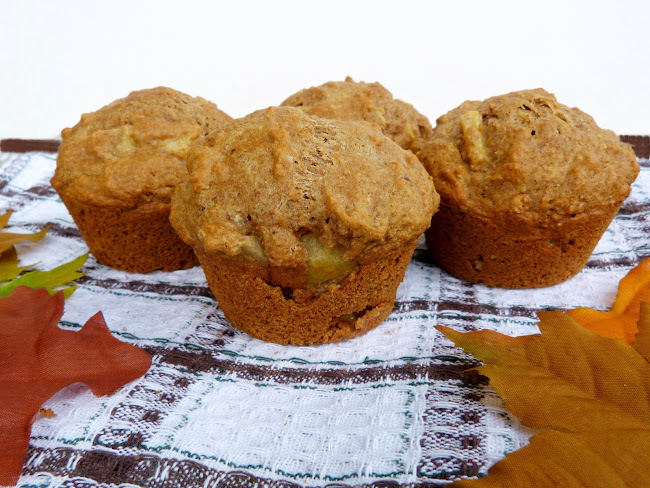 As promised in my last post, I have another pear recipe for you today! One of my favourite breakfasts that my mom used to make for us growing up was something called "teddy bear porridge". I'm not sure how it got that name, but it was basically a pot of oats cooked on the stovetop with chunks of hot apples, cinnamon and sugar. It was the perfect comforting bowl to eat on a cold morning! 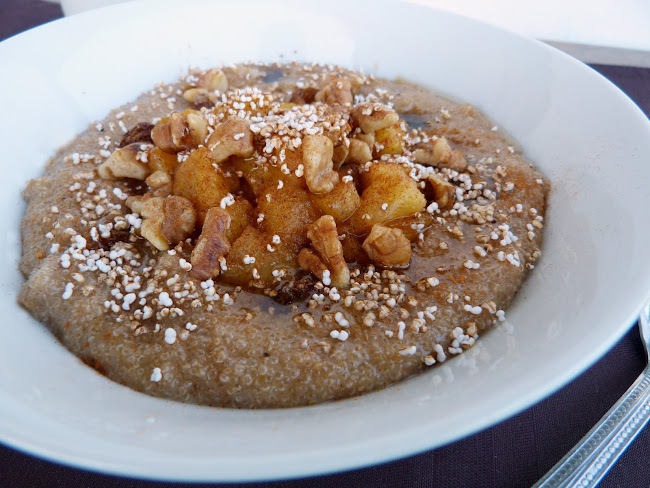 This recipe reminds me of that childhood favourite, but with a couple of twists: first, I used amaranth as the porridge base instead of oats, and second, I replaced the apples with sauteed pears. If you haven't used amaranth before, it's a tiny seed that looks similar to quinoa, and it can be cooked in a similar way too. I cooked mine in water and once it was all absorbed, I stirred in some almond milk to make it extra creamy for more of a porridge texture. I also added a cinnamon stick and some spices to the pot to incorporate more flavour. The pears were diced and sauteed in a pan with a bit of Earth Balance, sugar and cinnamon, until they were nice and soft. They can be served on top or mixed into the porridge so that every spoonful has a chunk of juicy sweet pears. 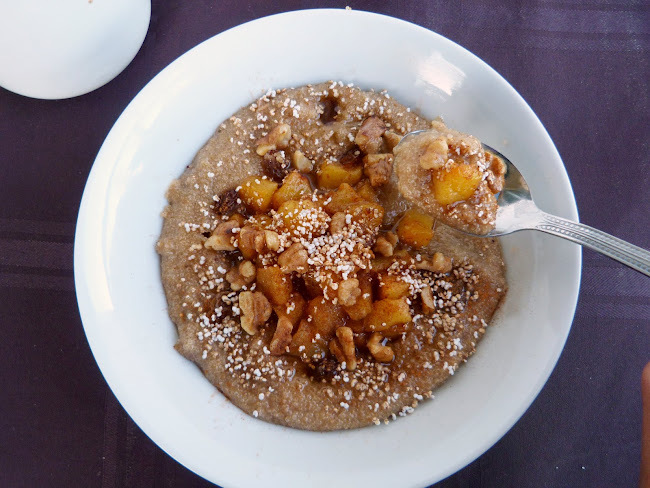 You can eat the porridge with just the sauteed pears, but to make it a bit more special, I topped mine with some raisins, toasted walnuts, popped amaranth, and a good swirl of pure maple syrup. 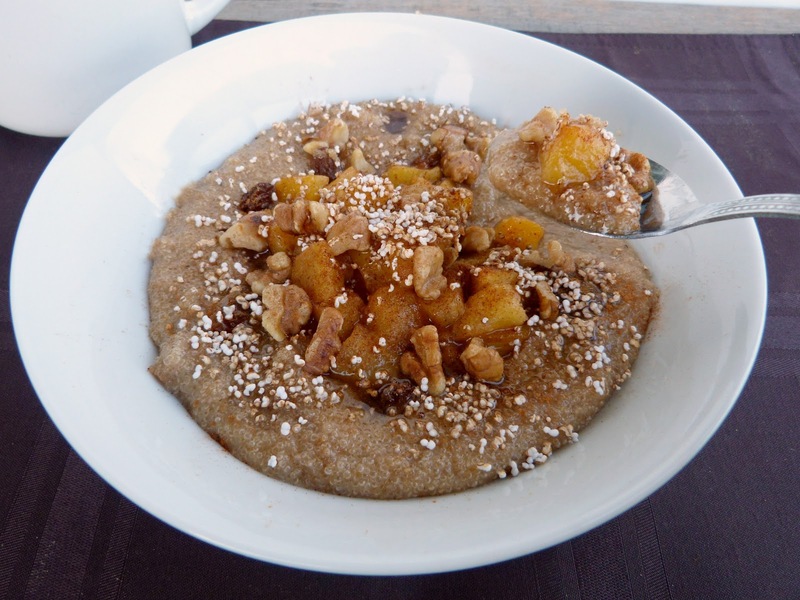 I would definitely recommend adding the maple syrup because the amaranth isn't very sweet on its own, but the popped amaranth is optional - I liked the extra dimension of texture that it added, but if you don't have time for that extra step, I think the porridge would still be just as good without it! 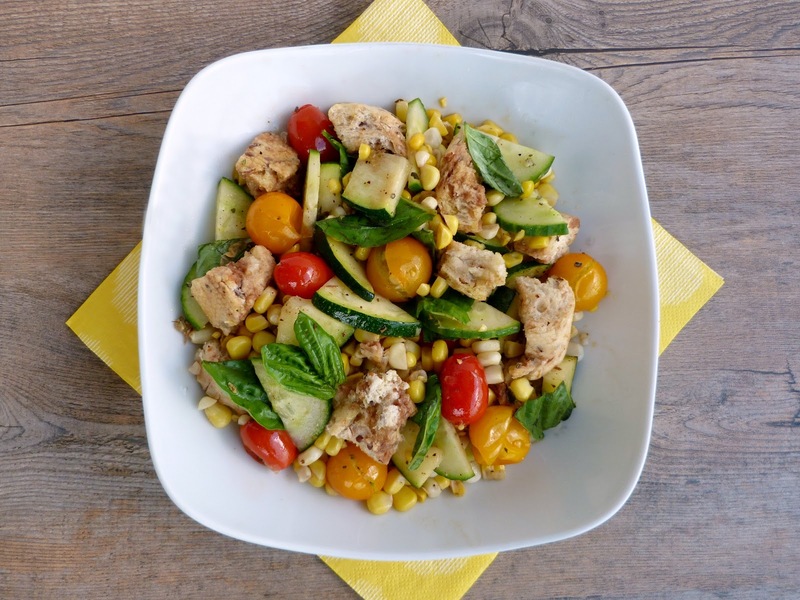 I actually ate a bowl of this for dinner and saved the leftovers for breakfast the next day. It was just what I wanted - a warm, comforting bowl of creamy porridge with the flavours of Fall! Not only is it comfort food, but it's really healthy too - amaranth is a good source of protein, fibre, calcium, and contains other vitamins and minerals, plus its gluten-free. 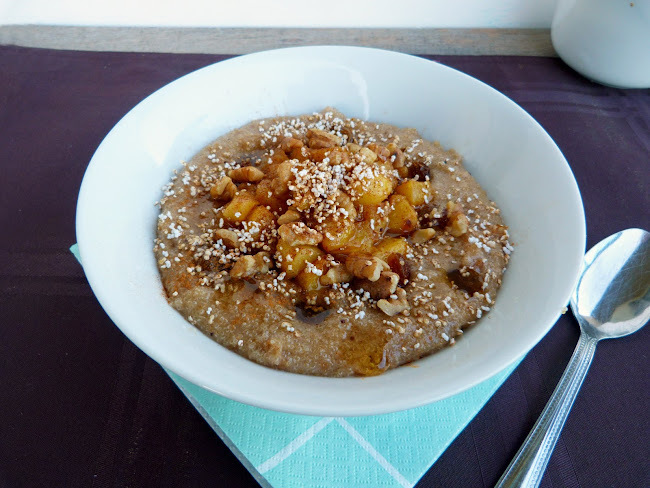 I still have fond memories of teddy bear porridge, but now I love this grown-up version too! Now, on an unrelated note - I just wanted to give you a heads up that things might be a bit quiet here on the blog for the next two weeks. In a few hours, I'll be off to the airport for another trip back to Africa! This time, I'll be visiting Nairobi, Kenya, where I have a week-long workshop similar to the one that I attended in Zambia a couple months ago. I'm even more excited for this trip because I've booked a mini-safari after our workshop! I'm going to the famous Maasai Mara reserve, and I'm lucky enough to be there during the great wildebeest migration. An African safari is something I've always wanted to do, and I can't believe that in just over a week, I'll actually have the chance to experience it myself! I'm not sure if I'll be able to do any posts while I'm away, but I'll do my best to stay in touch! 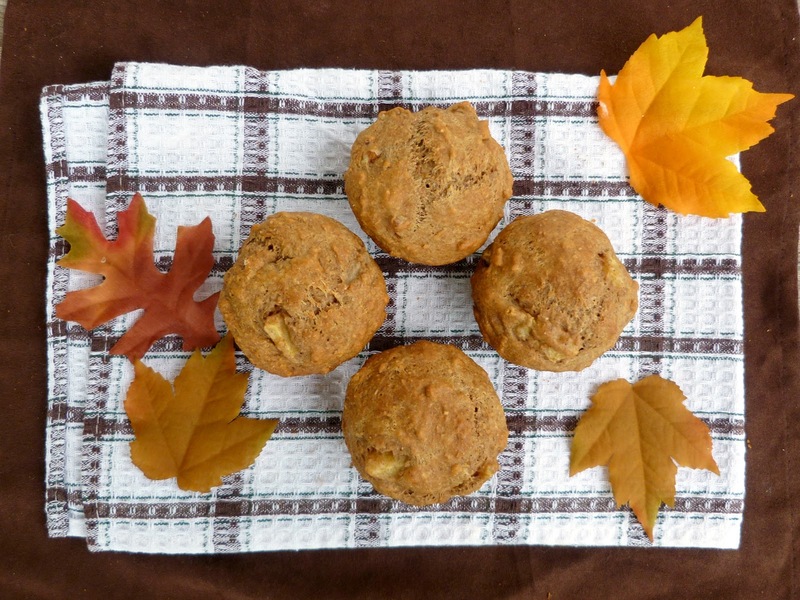 And I'll definitely be back with some more Fall-themed posts in October...I might be a bit late to the pumpkin party, but I've already got a can in my cupboard waiting to be opened as soon as I get back home! First, make the puffed amaranth topping (optional): Heat a small saucepan over medium-high heat. Once hot, add about 1/2 tsp amaranth and cover. Shake the pan a bit and wait for the amaranth to start popping. (if it doesn’t pop, throw out that batch and start again). Once it has popped, transfer to a small bowl and add another 1/2 tsp amaranth to the pot. Repeat process. Add the remaining 1/2 cup amaranth, water, cinnamon stick, ginger and salt to the saucepan. Heat on high until the water boils, then reduce heat to medium-low, cover, and let simmer for 15-20 minutes, until most of the water has absorbed. Remove from heat and add the raisins. Let sit, covered, for 5-10 minutes. Meanwhile, heat a small skillet over medium heat. Add the walnuts and cook for 3-5 minutes, until lightly toasted. Set aside. Keep the pan heated on medium-low and add a small bit of butter or cooking spray to the pan. Add the pears and sprinkle them with sugar and a dash of cinnamon. Saute for about 5-7 minutes, stirring occasionally, until they are are soft and warm. When the amaranth is ready, remove lid and discard the cinnamon stick. Stir in as much almond milk as necessary to get a creamy consistency. Transfer to a bowl and top with sautéed pears, walnuts, and as much of the puffed amaranth as you like. Garnish with a drizzle of maple syrup and a dash of cinnamon. For the last month or two, I've been on a hunt for one particular seasonal item every time I visit the farmer's market: fresh figs. Each time I went, I would think to myself: surely they'll have figs this week, they must be ready by now! So I would start planning all the delicious things I would make with my figs when I got home, but each week, I came home disappointed and empty-handed. Finally, last week my wish was granted and I was able to buy a small container of ripe black mission figs. 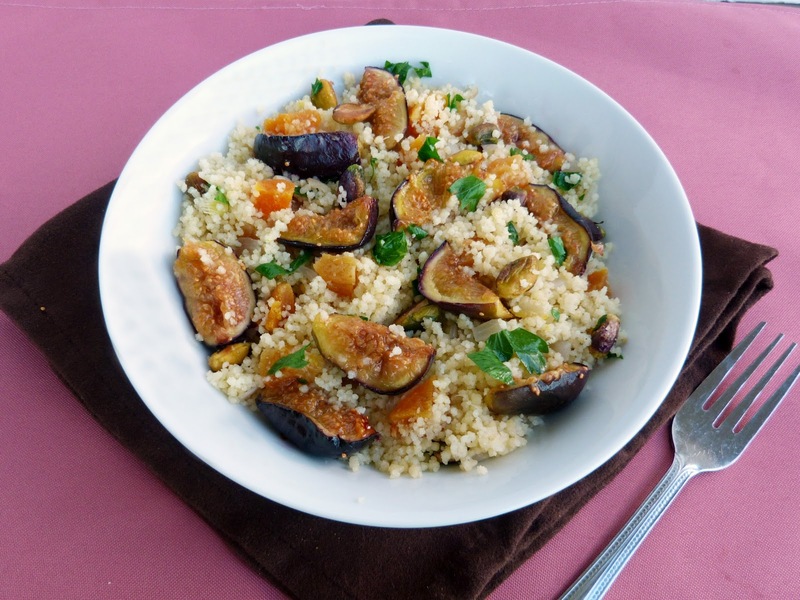 I ate some of them for breakfast - either sauteed with pears, or mixed into yogurt - and the rest of my figs went into this couscous dish. 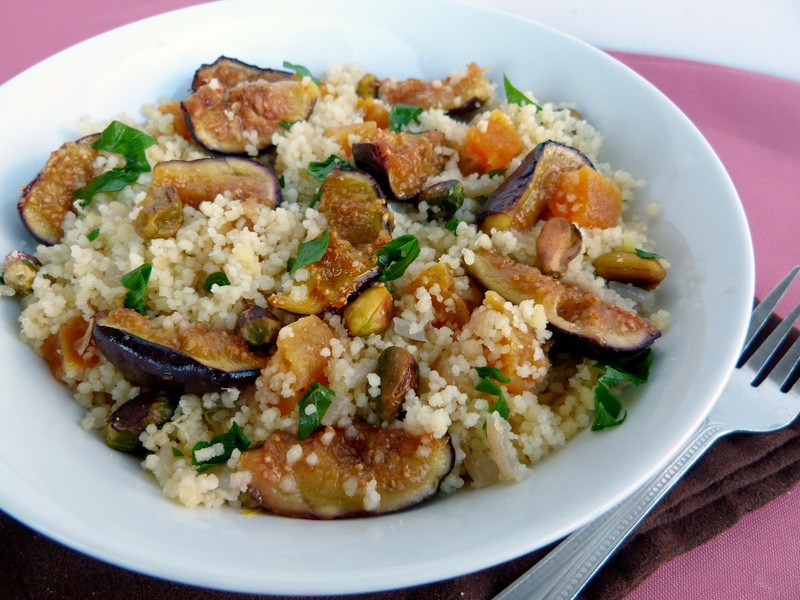 I was inspired by Moroccan couscous dishes that usually combine dried fruit, nuts and fresh herbs. So I put together a mixture of fresh figs, dried apricots, pistachios, and fresh parsley, along with some ginger, shallots and cumin for extra flavour. 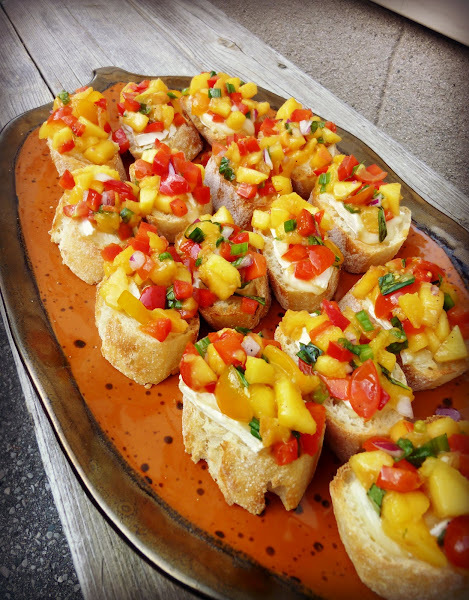 I really liked the mix of fresh and dried fruit in this dish. The figs were so juicy and sweet and tasted even better after being sauteed so they were nice and tender, and the pistachios added even more richness and texture. I tend to be fussy about fresh parsley, but I actually thought it went really well with the other ingredients here and helped to brighten the dish up. I used very little dressing, just adding a squeeze of lemon juice and a bit of olive oil to the couscous. I did find it a bit dry though, so feel free to add an extra drizzle of olive oil. Another option could be to serve this with some plain yogurt, or a sweet chutney - I tried eating my leftovers with a couple spoonfuls of mango chutney on top and loved it that way! 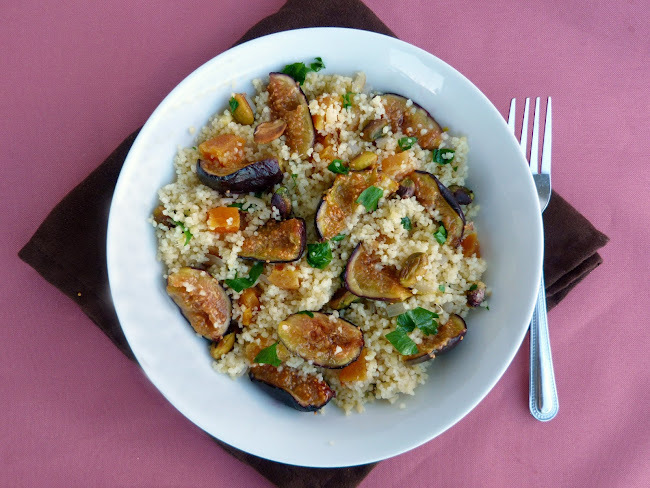 I thought this was an interesting and really tasty way to use up my figs, and it would make a great side dish for Fall meals. Although knowing my luck, fresh figs will probably be gone from the market already by this weekend, so I might have to wait until next year to make this again! Heat a small skillet over medium heat. Once hot, add the pistachios and toast for a few minutes, until fragrant. Remove from heat and set aside. Heat 1 tbsp olive oil in a small saucepan over medium heat. Add shallots and ginger and sauté for 4-5 minutes, until shallots have started to brown. Add water to the saucepan and stir in the cumin. Bring to a boil, then stir in couscous and apricots. Remove from heat, cover, and let sit for 10 minutes. Meanwhile, heat the small skillet again to medium and spray with cooking spray. Add the quartered figs and drizzle with a bit of honey. Let cook for 3-4 minutes, stirring occasionally. Remove from heat. When couscous is done, lift lid and fluff with a fork. 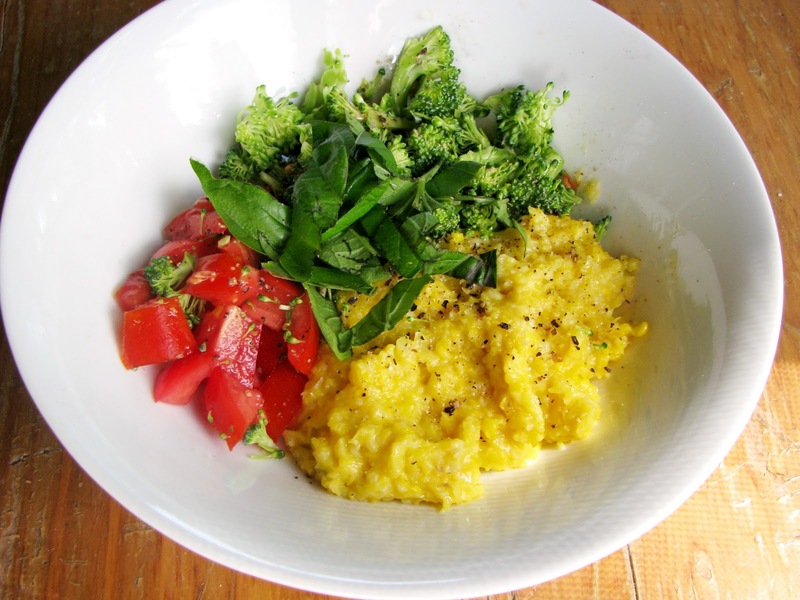 Stir in the lemon juice, lemon zest, parsley, 1 tsp olive oil, and salt and pepper. Mix in the pistachios and figs. Season with salt and pepper to taste and top with a spoonful of yogurt and/or chutney if desired. 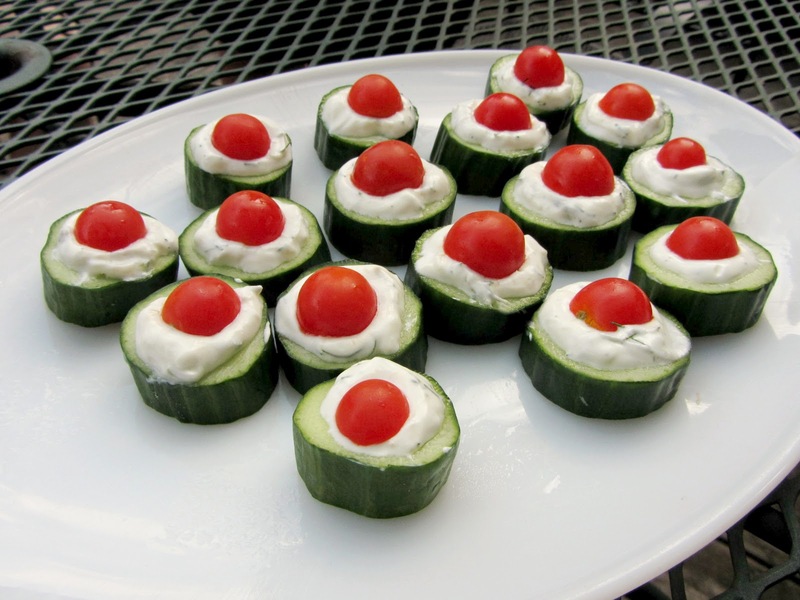 This was submitted to Wellness Weekend at Diet, Dessert, & Dogs and Healthy Vegan Fridays. 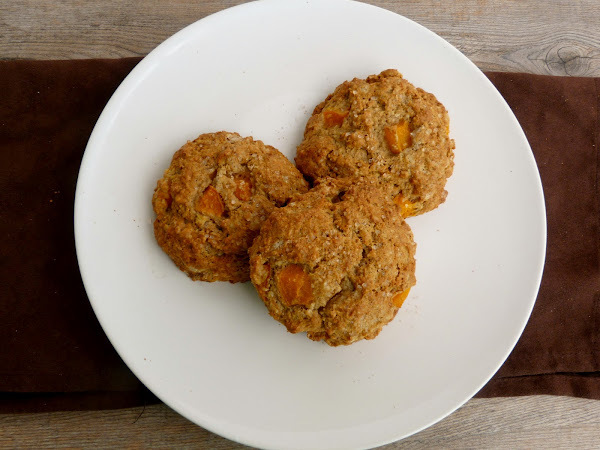 I know you're probably looking forward to a new recipe this week, but I had such a great weekend that I wanted to share my experience with you today instead! This weekend was the 28th annual Vegetarian Food Festival held in Toronto, Ontario - a place for over 100 exhibitors to showcase their products, plus lots of speakers and demonstrations. It's such a great way to try out new products from the likes of Earth Balance, Coconut Bliss, Daiya, Field Roast and tons more, and to learn all about them by speaking to the vendors! Despite living close enough to Toronto, I've never been to the festival (in fact, I had never even heard of it until last year). This time, my sisters and I decided it would be worth the trip, so we headed up there on Saturday excited to fill up on lots of vegan and vegetarian goodies! The weather wasn't great, but the rain managed to hold off for most of the day, and we were too excited for all the samples to care about the weather! 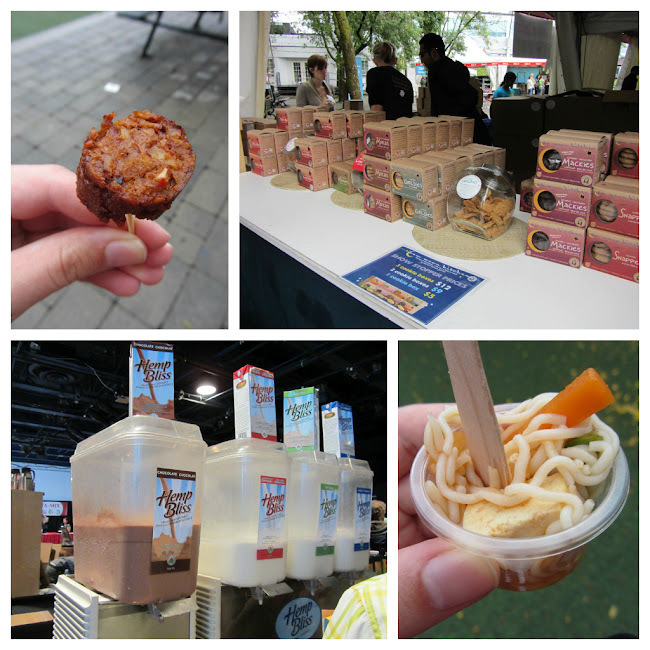 What I loved most about the festival was the fact that every single product, sample, and menu item was vegetarian, and the majority were actually vegan. Plus there were tons of gluten-free and raw products, so no matter what your diet was, there was lots for everyone to eat! As I'm sure other vegans and vegetarians would understand, it's just such a thrilling (and almost overwhelming) feeling to know that I could eat everything in sight if I wanted to, and I didn't have to limit my choices to only one or two items off any menu! Here are some of the samples I tried - thanks to my sister Natalie for taking the photos! 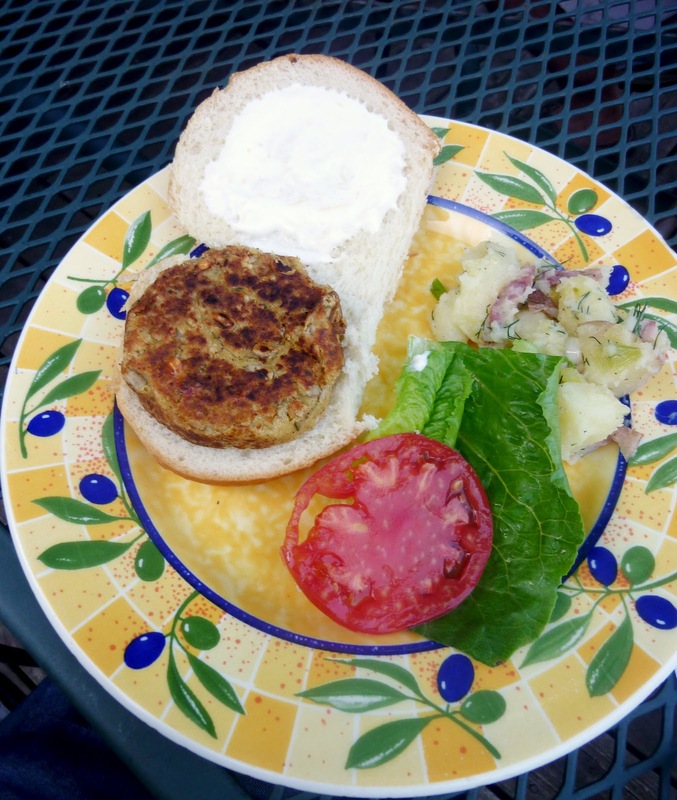 At the top is a piece of Field Roast veggie sausage, which I've written about on my blog here. They were sampling three different flavours (the one pictured was the Mexican Chipotle), and the smell of them cooking was so good, especially on a chilly day! There were lots of bakeries selling vegan goodies like cookies, loaves and cupcakes, and some of them were offering samples of their products. I tried a ginger snapper from New Moon Kitchen (pictured top right) and I loved the taste and texture. My sister sampled the chocolate-coconut "Mackies" and raved about them too! In the bottom right corner is a sample of tofu shirataki noodles mixed with veggies, tofu and a sweet-and-spicy sauce that was really tasty. This wasn't my first time trying shirataki noodles, but my sister was surprised by how much they tasted like pasta noodles. There were also at least a few booths sampling non-dairy milk beverages, like the Hemp Bliss station pictured above. One booth even had milk made from kasha - I had no idea such a product existed! One of the best samples that I got was from the Vegenaise booth. They were offering tastes of two of their products on veggie straws - the original and the reduced fat vegenaise, and they gave out a mini jar of each kind to take home! I was really excited because I've been wanting to buy myself a jar of Vegenaise for awhile now, but I was waiting for them to go on sale! Out of all the samples that I tried, there were two that I was convinced to buy so that I could take them home. The first was this buckwheat snack from ShaSha Organic Artisan Bakery. 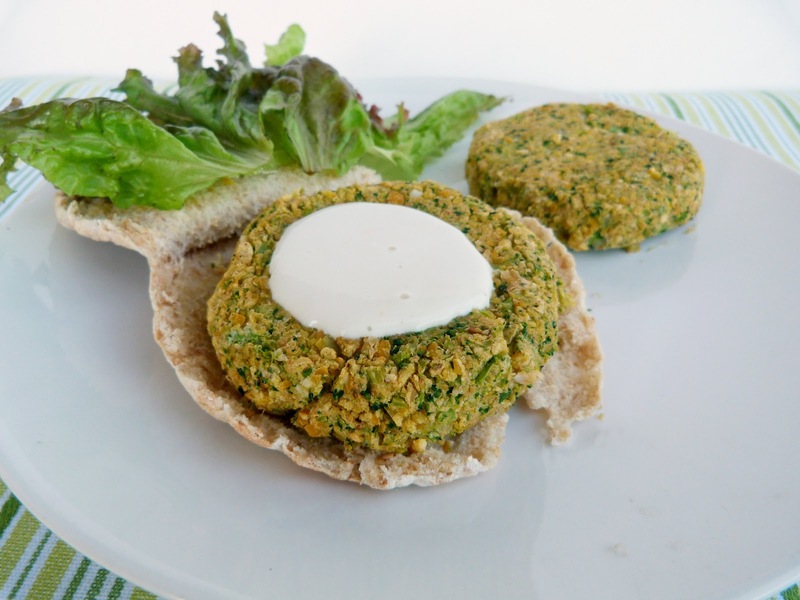 Their buckwheat snack is raw, vegan, and gluten-free, plus low in sugar and fat. I bought the ginger and cinnamon flavour, which is sweetened with agave and has three different kinds of dried fruit. 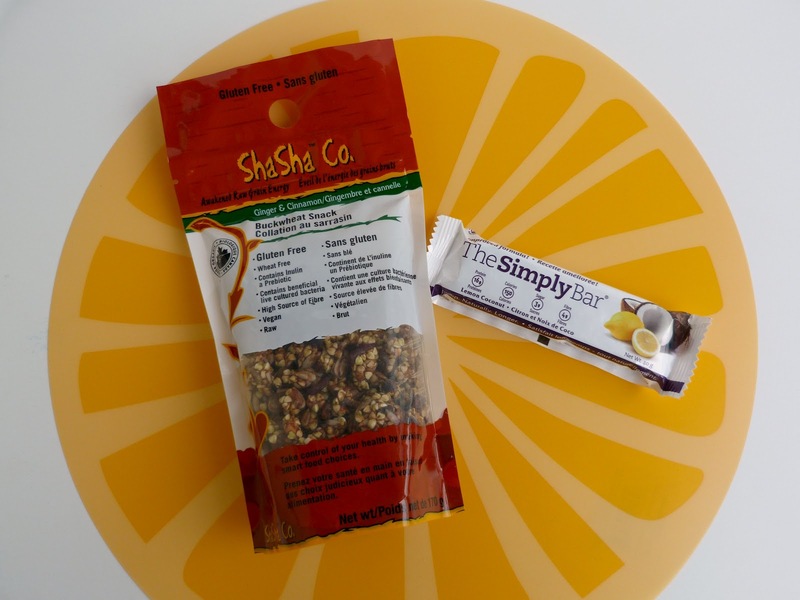 I absolutely love this snack with its crispy bites of buckwheat groats and the chewy dried fruit, and of course the warm spices! I also sampled lots of different brands of energy bars at the festival, but one that I really liked was the lemon-coconut flavour of the Simply Bar, which had a light crisp texture and a nice refreshing flavour. So when I saw it on sale at the grocery store the next day, I had to buy it! Even though I had already filled up on samples, I still wanted to try some of the actual food that was available to buy. There were a few different Indian places offering Indian chaats (street food), which I can't get at any of the Indian restaurants in my area, so I was excited to try some! I went with this chaat papdi, which is a mixture of chickpeas, potatoes, and crispy fried "papdi" topped with yogurt and two types of chutney, plus raw onions and sev noodles. 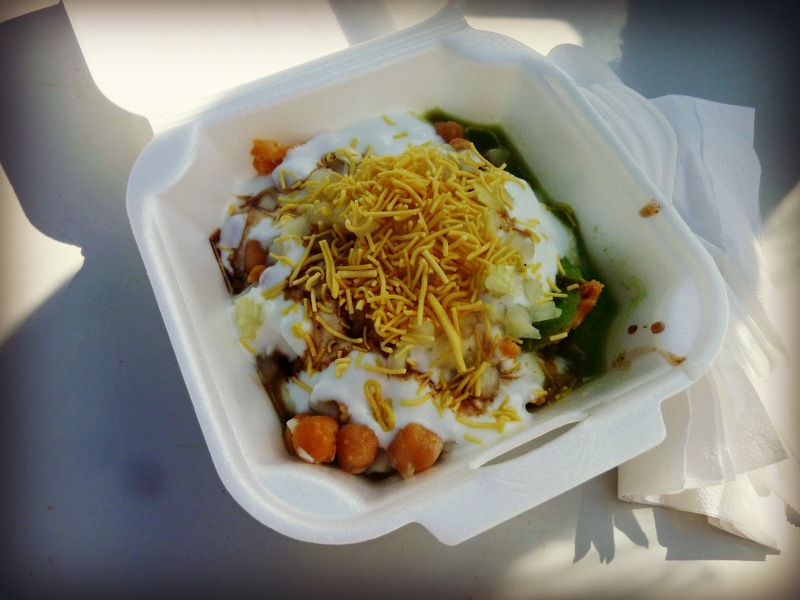 I love Indian chaat because of the explosion of different flavours, and this dish was no exception! My favourite part was the all of the extra sauce - yum! 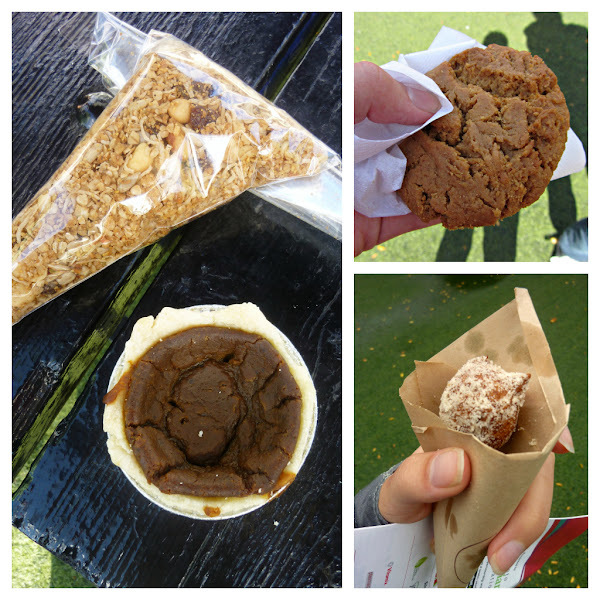 And finally, I couldn't leave without tasting some of the vegan desserts that were available! On the left was a coconut granola that I sampled and really liked, so I bought a small bag to take home. I also got a vegan pumpkin molasses tart from Apiecalypse Now Bakery. The tart was the most interesting pumpkin dessert I've had in a while - it was like equal parts pumpkin pie and sticky sweet molasses, all in a delicious soft flaky pie crust. My sister bought a flourless cashew cookie from Sweets from the Earth as her dessert (pictured top right), which was nice and thick and chewy. I also got miniature sweet potato doughnuts from LPK's Culinary Groove, which I never would have guessed were vegan and gluten-free! After all that snacking in the afternoon, we took a break for some shopping and drove to Burlington, where we managed to fit in an amazing dinner at a raw, vegan restaurant that I've been wanting to try for a while - the Naked Sprout. 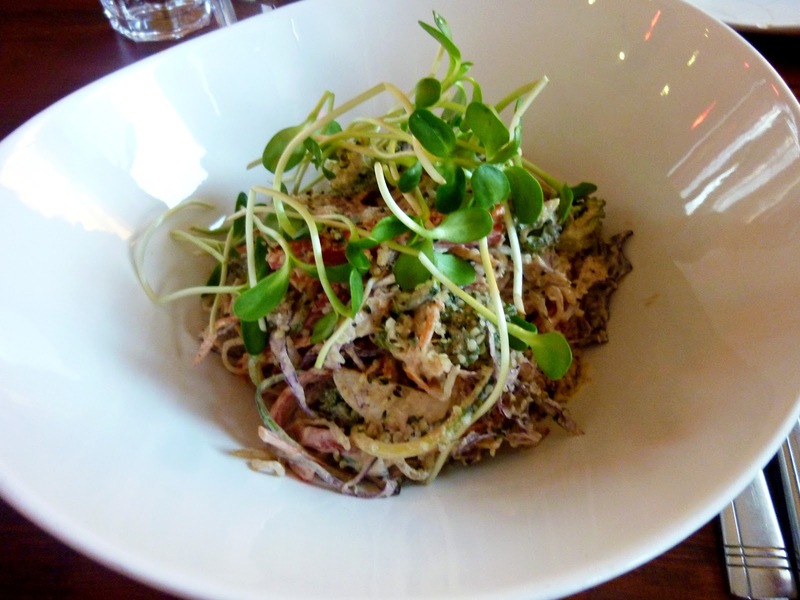 Once again, I was a bit overwhelmed by all the choices on their menu, which includes both raw and cooked options. I finally settled on the zucchini and kelp noodle bowl, which came with fresh veggies and a delicious almond tamarind sauce. It looks small in the picture, but the portion was actually quite large and filling, and I was definitely happy with my choice! Other menu items that we tried included the raw rolls appetizer, which were filled with kelp noodles and veggies and came with a pear chili sauce for dipping. I sampled the sauce and it was really interesting - like a spicy pear twist on applesauce! 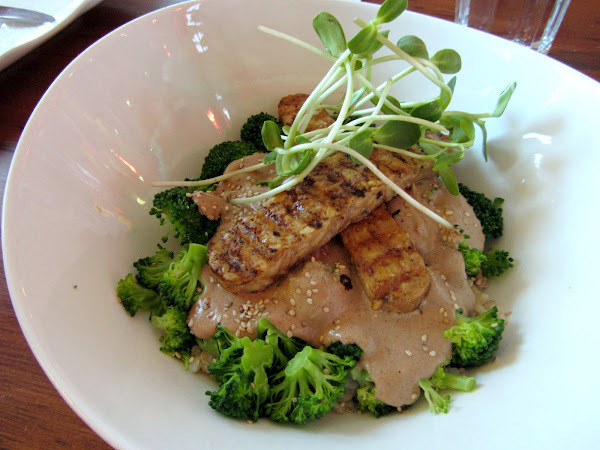 Finally, my sister ordered the Warrior Bowl, which was brown rice with broccoli, tempeh, and a thai almond sauce. 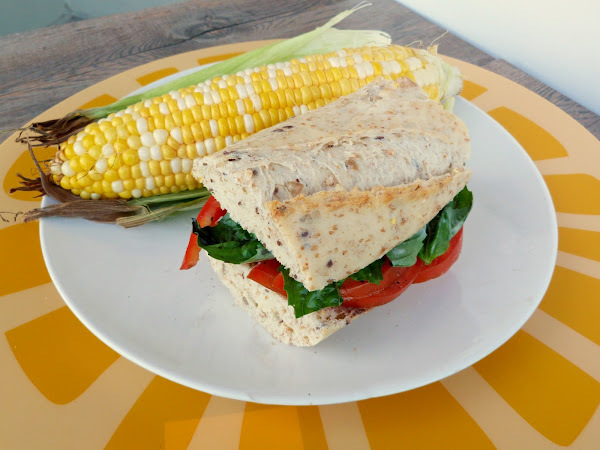 It was her first time trying tempeh, and she loved it! What I loved most about the restaurant was all the different types of sauces on the menu, and I was happy to see that they were very generous with the sauces in each dish, because that's always my favourite part! 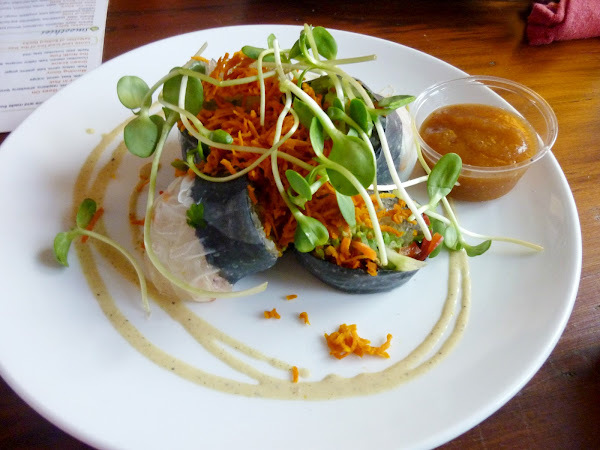 Overall, I feel so lucky that I was able to enjoy so much delicious vegetarian food, all in one day! And if you missed this year's Vegetarian Food Festival, I would definitely recommend checking it out next year if you're in the area! Here in Ontario, today marks the official start of another school year. As I mentioned in my last post, this doesn't mean as much to me anymore, but I'm sure a lot of you have either been dreading or looking forward to this day for a while! 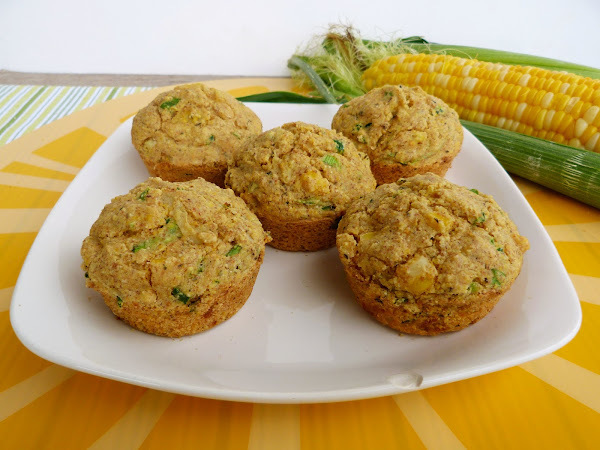 Even though I don't have kids of my own, I'm well aware that back to school time means having to scramble each morning to put together a healthy lunch (or two...or three...). A storebought packaged granola bar is a good option to throw into lunchbags as a snack, but if you can pack homemade granola bars with whole grains, natural ingredients and no added sugar instead, that could be an even better idea! 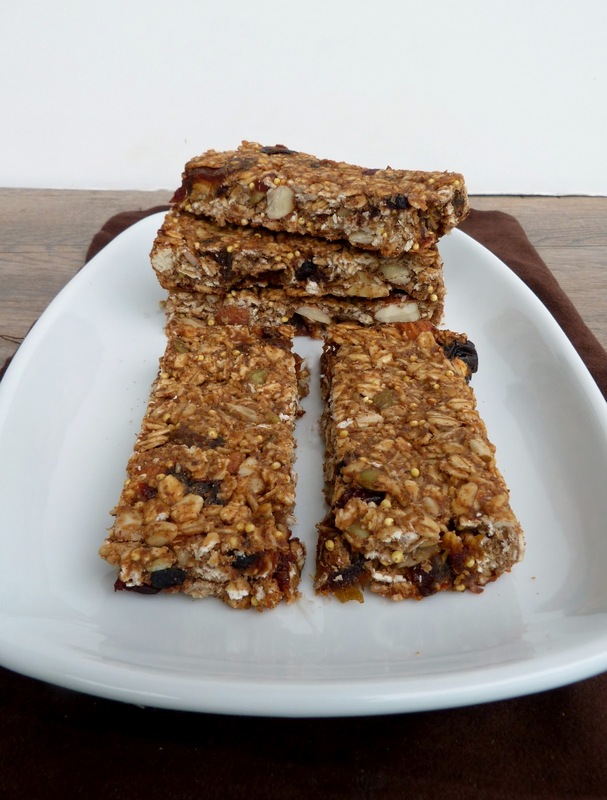 I thought this would be the perfect time to share the latest granola bars to come out of my kitchen. For this particular batch, I went with a base of rolled oats, almonds, millet, mixed seeds, and dried fruit, held together with a mixture of almond butter and mashed banana. 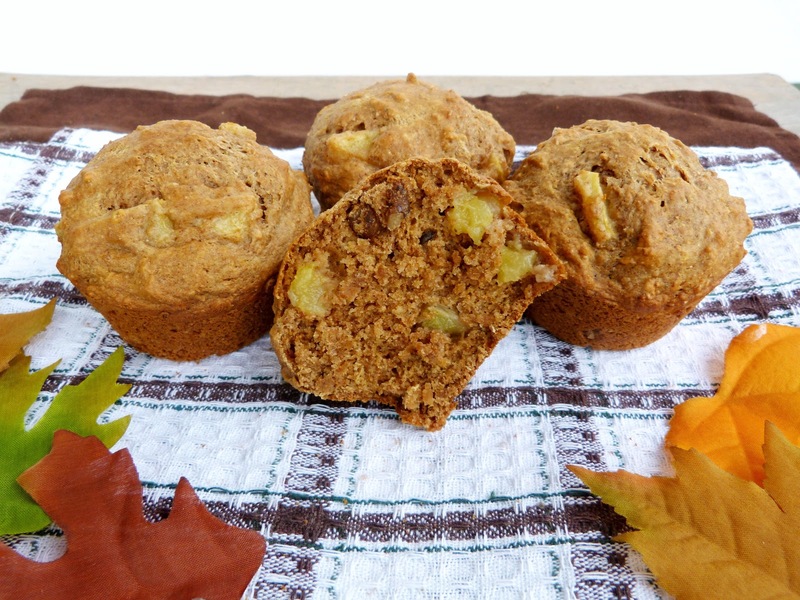 I almost left out sweetener completely, since I figured the banana and dried fruit would add plenty of natural sweetness, but I ended up adding just a tablespoon of coconut nectar because its thick and syrupy texture would help bind the ingredients even more. 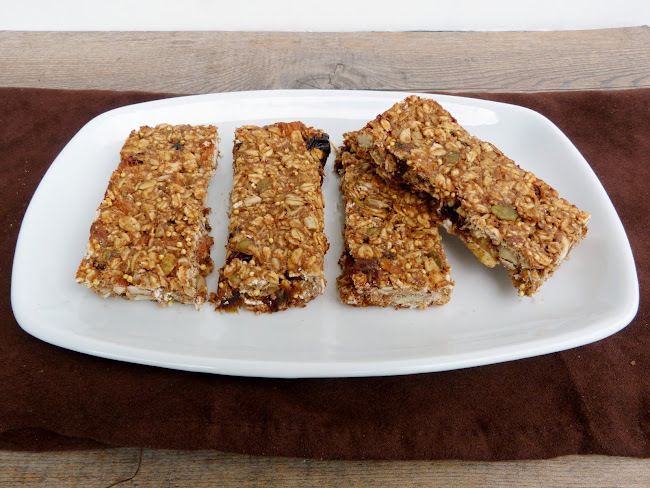 I thought these granola bars held together well and had just the right amount of sweetness for my tastes. They also had a good textural balance of chewy and crunchy - my favourite parts were the tart dried cherries that I added, and the extra bits of crunchiness from the tiny grains of millet. I also liked that these granola bars were nice and hearty - one bar filled me up for two or three hours, unlike some of the granola bars you can buy from the grocery store. 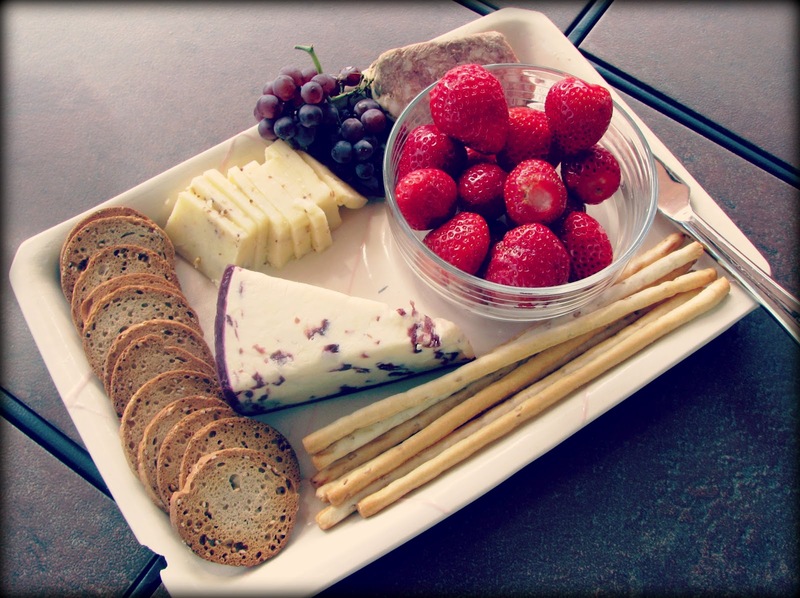 Or if you're looking for a lighter snack, you could also cut them into smaller squares. 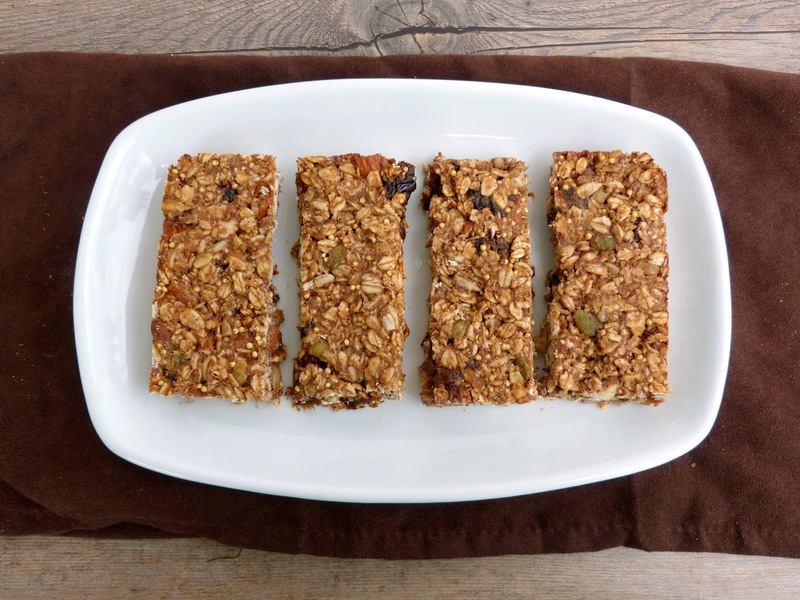 So whether or not you have any lunchbags to pack this week (for yourself or your kids), these granola bars are a great healthy option, and they're pretty easy to make too - you probably have a lot of the ingredients in your pantry already, and if not, they're very adaptable to what you have on hand! Preheat oven to 350°F and prepare an 8x8 inch pan by spraying with cooking spray or lining with parchment paper. Place almonds, dates, and dried fruit in food processor and process until roughly chopped (alternately, you can chop by hand with a knife). Transfer to a large bowl and add oats, millet, seeds, cinnamon, salt, and flax. Use a whisk to mix thoroughly. Place almond butter and mashed bananas together in a small bowl and microwave for about 30 seconds. Stir or whisk until smooth (you may need to microwave it again for another 15 seconds before it is smooth enough). Stir in the vanilla and coconut nectar. Pour the wet mixture into the dry ingredients and stir with a rubber spatula until all the dry ingredients are moist and evenly coated. Pour mixture into prepared pan and press down firmly with a rubber spatula. Bake for 22-27 minutes, until the edges are browned and the top is firm. Let cool in the pan for a few minutes, then invert onto a wire rack to finish cooling. Once completely cool, cut into bars.